The race HQ for the Frosty 5 Mile is at Pioneer Path Elementary School in Channahon and most runners hang out on the bleachers in the gym before the race. In the back corner, there is an emergency exit that some people use to go back and forth to their cars; every time the door opened, you would get a glimpse outside and the view got whiter, and whiter, and whiter. The snow started about 30 minutes before race time and by the time the gun went off, the streets were covered in over a quarter inch of the fluffy white stuff. 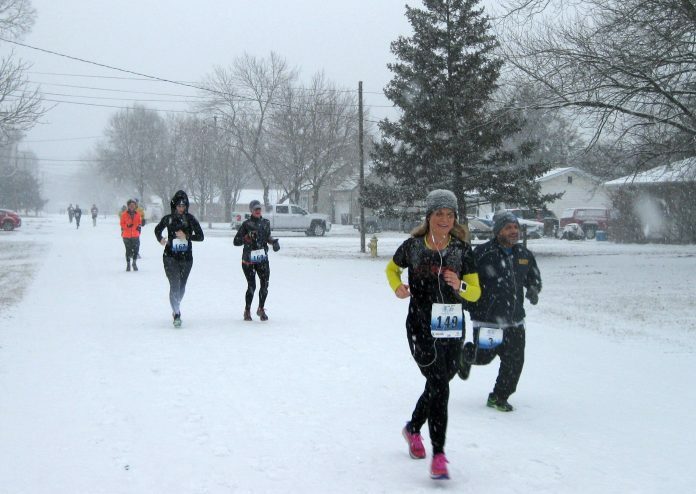 Runners seemed to embrace running through the snow covered streets, even though it made the streets a little slicker and the hills a little tougher. 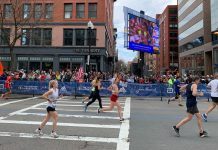 On the mostly out-and-back course, there were plenty of smiles and cheers for passing runners as they crossed and the 40th edition of the race surely lived up to its name. 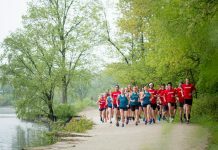 The race, which is put on by the Channahon Park District, is an annual tradition for many runners in the southwest burbs. Runners from all over the Chicagoland area venture out each year, too, to test their abilities in February – a month when races in the area can be a little scarce. 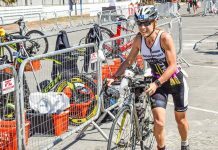 Aside from the course and the unpredictable conditions from year to year, one of the highlights of the race is the amount of stuff you get for the price. All runners receive a stocking hat. At the finish line, there are finishers medals. Pizza is served for post-race snacks. And, finally, this year, for age group awards, winners received custom scarves with their age group and place embroidered right on the end. The Frosty 5 Mile is a community event that is touted as a favorite for many in the area, and it is easy to see why. First time runners can be heard saying they will return next year to tackle the hills once again and, no matter what their finish time is, enjoy a slice of pizza to top off a tough run.